She turned and looked at me with wide eyes. At this point I should tell you that we don’t have an actual live hamster in our home. What we do have is a Zhu Zhu Pets toy hamster—the most annoying toy in the house. A battery operated toy, it makes both chittering and squeaking sounds and moves around on its wheeled “feet”, changing direction if it bumps into something. It has buttons to fool you into thinking you’ve turned it off, but a few minutes later, the chittering and the motorized wheels sound again. Looks cute, but is darn annoying. For whatever reason that night, E2 decided to put the Zhu Zhu pet on her head. And right on cue, the wheels started turning, winding up her hair. I took the hamster from her hand into mine, and tried to unwind her hair from the wheels. No luck. Of course, the thing made more chittering sound and the wheels moved, making sure that hair was nicely tangled. E1 of course is making all sorts of comments that are making E2 feel worse. Of course! He took the screwdriver and worked out the screw holding the battery case to the hamster body. E2 is sobbing now and is definitely not appreciating the jokes the rest of us are making about the hamster on her head. The body comes off the battery case, and now the wheels are fully exposed. Daddy saves the day and is able to unwind her hair from the wheels, losing only one hair in the process. E2 is just inconsolable after this point. Whether she was more embarrassed by what she did, or scared that she’d have a hamster permanently stuck, or worried that she’d lose a chunk of hair, or just being overwhelmed by all these feelings, she could not process the fact that all was well. Even the good ol’ drink-some-water-to-stop-the-sobbing-trick didn’t work. It usually works, with both kids, but this time she’d start back up just seconds after taking those 5 sips of water. It took her an hour to calm down, needing to snuggle in Mommy’s bed with Mommy, before she could finally fall asleep. All was well in the morning. T was going to throw it in the garbage, but surprisingly, E2 still wanted to keep it. 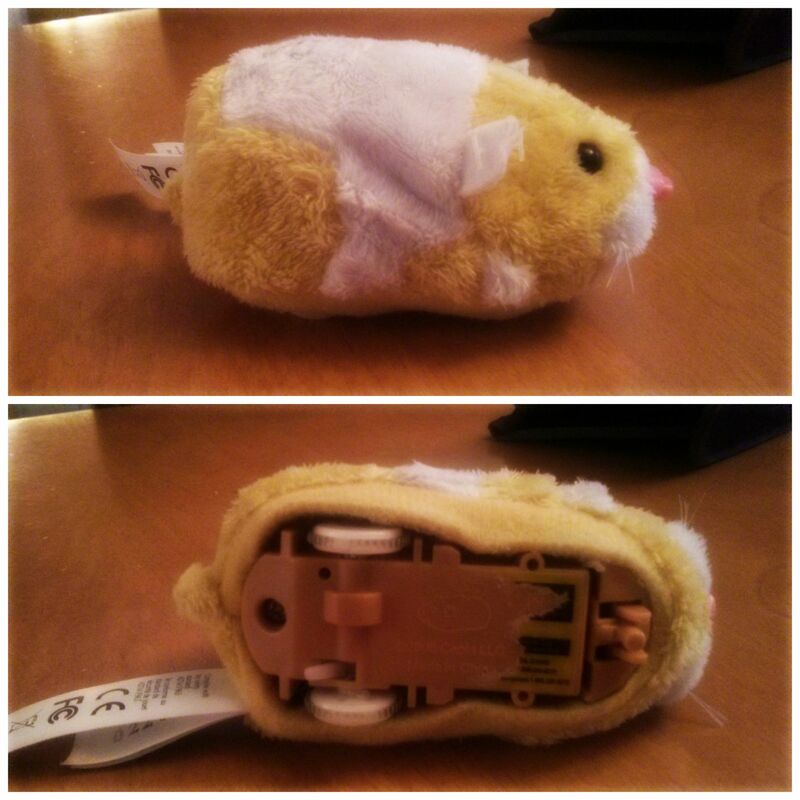 This thing is for sure though—the Zhu Zhu pet will see no more batteries while in our household. And “that time that E2 got a hamster stuck on her head” will go down in our family lore. Update (2015-09-26): this morning while having a discussion with the girls on what “tagging” is on social media, we brought up how this might be used in a bullying sense. Where others may have an embarrassing picture of you and then when they tag you, everyone who follows you will then see the picture. As an example, I brought up how if we had taken a picture of E2 with the hamster on her head and then posted it on Facebook and tagged her on it, then all her friends and family could see the picture if they followed her. Well, this caused E2 to burst into tears anew, which lasted longer than expected. Wow, I was not expecting that a hypothetical picture would cause that reaction. The psychic wounds must still be so deep…so do me a favour, if you do happen to see E2, can you please do us a solid and *not* mention this incident? Thanks in advance.